Fiction – paperback; Vintage Classics; 240 pages; 2008. The sisters are Sarah and Emily, separated by four years — and a whole host of differing personality traits. Sarah, the eldest, is confident and pretty; Emily is intellectual. Both choose to lead very different lives — Sarah marries young and starts a family, Emily pursues a career — but neither of them find happiness. There’s not much more to the story than that, but in Richard Yates’ carefully understated writing style there is a real emotional depth that resonates long after you’ve reached the final page. The more distance I put between the book and writing this review, the more I’ve come to appreciate the tragic beauty of these sisters’ wasted lives. 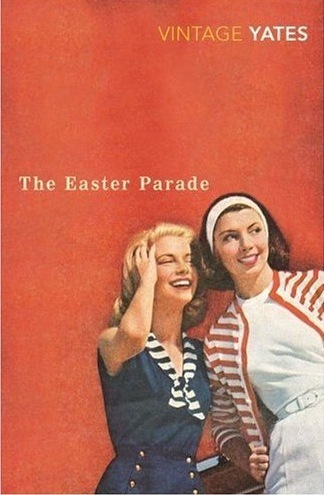 First published in 1976, The Easter Parade was Richard Yates’ fifth novel. It is set in New York and covers a 40-year period from the 1930s to the 1970s. It provides a fascinating glimpse of two opposing views of womanhood — that of wife and mother, and that of single women who pursue fulfillment through work — ideas that seem unusual for a male author to write about with such aplomb and insight. Indeed, male characters are few and far between in this novel, and when they do appear they are relatively weak and spineless. For instance, the girls’ father, a newspaper man who writes headlines in the New York Sun, a job of which his daughters are incredibly proud, seems to fall apart after the divorce, turning to drink and telling his daughters he is “only a copy desk man” and not especially talented. Sarah’s husband, Tony, initially handsome and charming, turns out to be uncouth and abusive. And pretty much every man that Emily ends up with — and there are a lot of them — lacks any kind of self-esteem. But neither sister ever comes to the realisation that they deserve better. That lack of self-awareness may be due to the girls’ mother, the slightly eccentric and over-the-top Pookie, who seems to emasculate anyone, male or female, who comes within 15 feet of her orbit. In fact, Emily finds her so demanding that entire years go by in which Emily avoids her mother completely. Even when Pookie is in an old folks home, Emily feels no guilt in not making the effort to visit her. The Easter Parade is a sad tale, but it’s incredibly easy to read, and the pace is ferocious because Yates doesn’t bother with unnecessary detail — he’ll often miss out entire years by using phrases such as “two years later” or “for a few years” — but it doesn’t come at the expense of characterisation or plot. I found this book the perfect antidote to “reader’s block” and ate it up in a weekend. My only quibble, and it’s a very small one, is that The Easter Parade is largely told through the eyes of Emily, so you never really get to understand Sarah’s motivations and why she makes the choices she makes. The best you can do is to simply guess. Finally, many thanks to regular reader Jeniwren, from Oz, who sent me this book a couple of years ago; it only made its way to the top of my TBR a couple of weeks ago! I’ve now gone out and bought some of his other novels. I expect a Richard Yates’ binge coming on very soon. I’d had this one marked down as a possible for this fall (when the current season of MadMen ends) — your excellent review confirms that I should proceed with that strategy. I do find a lot of echoes of Yates in MadMen (the creators are major fans) and I think one of the reasons for his renewed popularity is that our current troubled times are sparking a revised interest in some of the noirish writing of the 60s and 70s that tended to get overlooked at the time. As for your contemplated binge, Yates — like McGahern — is one of those authors whose work I am stringing out over as long a period as I can. I really want to read this. I bought a Yates novel a couple of weeks ago (don’t have the book to hand, can’t recall the title) and have been very much looking forward to it. Your review makes me even keener to get to it. I haven’t read any Yates yet (seen Revolutionary Road and have book on TBR) but this has been top of my wishlist for some time with your review intensifying the need to read it. Another glowing review of this book… maybe I should give it a try! There are definite elements of Mad Men in this novel, Kevin. Indeed, Sarah could be Betty Draper and Emily could be Peggy Olson! (I missed the start of the latest series and will have to wait for BBC iPlayer to do a “series catchup”, otherwise it’s going to be a bit of a wait for the boxed set). And I think you’re right about the renewed popularity of these kinds of novels — and Mad Men — maybe because they show how far we’ve come today in terms of equality (sexual, racial etc) and that the lives we lead now aren’t so bad after all? You’re supposed to be enjoying your holiday, Lisa, not reading my blog!! 😉 Oh, and don’t mention the 19th Wife, I tried to read that last year and ended up donating it to my local charity shop when I realised at about page 10 that it was not my type of book! I wouldn’t call it great literature, and it’s not even “beautifully written”, but it’s a good story, well told, and one that examines how the choices we make in life affect our happiness. It has a lovely melancholy feel to it, which I quite like in fiction. I saw Revolutionary Road, too, but don’t think I could quite bring myself to read the book — it’s so damn depressing! I think you would like The Easter Parade, it almost has the feel of a Virago imprint, and the 1950s New York setting is rich and vivid. I’ve never seen this book reviewed anywhere — not that I’ve looked. But it’d be hard to give it a bad review. I’m putting this one on my “I’ll think about it” list. I like the sound of this one, however I dont own it and cant buy it so I cant read it… yet! Ha! This has made me want to dig out my copy of ‘Revolutionary Road’ though, I have put of seeing the film until I have read the book. I have always wanted to read Yates but at the same time something makes me hesitant no matter how many wonderful words I see around here and there. Funny when you get like that about an author isnt it? This sounds like my kind of book! I will order a copy from Amazon. Oh, also, I have to tell you that I visited Daunt Books (Marylebone High St) today whilst walking back to Paddington from work (tube strike!) and it was HEAVEN! I remembered that you did a great review of the shop a while ago. Bought two books (historical London based) and a great Daunt Books canvas bag! Ahhh, isn’t Daunt Books fab?? I’ve discovered that I can easily walk to the branch in Holland Park — for awhile there I used to make it my Sunday exercise, but it was beginning to get expensive, so haven’t been for a month or so. To give ‘The Easter Parade’ only four stars, you are a hard taskmaster. Of course what is the sense of a rating system if every book is perfect? I think you’d like this one, Simon. It’s very short and easily read in a day or two. But it’s bleak and sort of frustrating, because you know the women didn’t have to lead such miserable lives if only they’d made better choices. Hard task master? Never! 😉 Mind you, I don’t think this is a perfect novel, it’s not even especially beautiful prose. But it’s an interesting story, told with clarity, and it works on some kind of subconscious emotional level. I’m itching to see what his other novels are like now… I take it you’ve read this one? I haven’t read anything by Yates yet, although my father recommended Revolutionary Road and it seems everyone’s either read it or seen the film. But it seems depressing and I’m not sure whether I’m in the mood for it right now. However, The Easter Parade looks good. There’s something about the women’s lives that makes me want to know more about them. Lovely review, Kim. That opening line is a killer, isn’t it? As you say, it sets the tone for the whole novel. I loved the depth of characterisation in Yates’ portrayal of these two sisters. Apologies for delayed response, Jacqui… I’ve had one of those ultra-busy weeks! But yes, that opening line is great and really sets the tone for the rest of the book. I do think I need to read more by Yates, but there’s only so many books I can read at one time!